If your child is not going away to camp or summer school, it is entirely up to you to provide day-to-day entertainment. 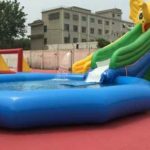 A reasonable sized yard can open many opportunities for you, one of them is the installation of a kids inflatable water slide. You won’t believe how many hours of fun this seemingly simple structure can provide. Not to mention, it is easy to find one online or offline in the nick of time! 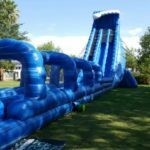 Admittedly, a slide can cost several hundred dollars, but you have to keep in mind that it’s an accessory that can be used for years to come. 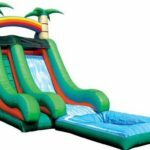 In fact, since the slide is inflatable, you can collapse it when summer is over or you need your yard back, and you can safely store it away in your garage. 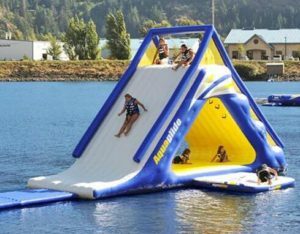 When properly folded up and without excess air, the slide hardly takes up any space, making it an ideal investment that resembles the perfect water park. 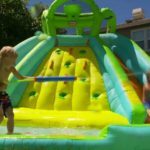 You will find that your children are less likely to get into trouble around the neighborhood when they have a small water zone to keep them busy. If you have work to complete indoors, you can still keep an eye on your little ones and not have to worry about them begging you to take them to the community pool or waterpark. 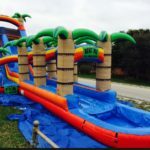 Which brings up our next point: an inflatable water slide is much safer than having a permanent in-ground pool in your backyard or taking your children to a waterpark. 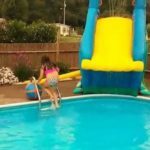 Most water slides have a small pool built-in that’s enough to provide enjoyment, but not deep or wide enough to cause accidents. This is also an important scenario to consider if one of your children doesn’t know how to swim. The great thing about water slides is that they can function well even with shallow water at the bottom. Still not convinced about making the investment? 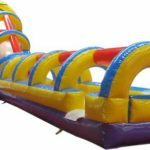 You really can’t overlook the convenience this inflatable structure can offer, and the fact that it is easy to set-up, requiring little or no maintenance. The same thing cannot be said for a swimming pool, as that requires hired hands to maintain or keep clean. 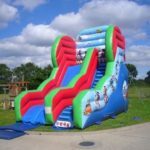 If you want to have your children test out an inflatable slide before making such a big purchase, there are plenty of equipment rental services that you can rent one from!